Austin metro area. Graphic: Google Maps. 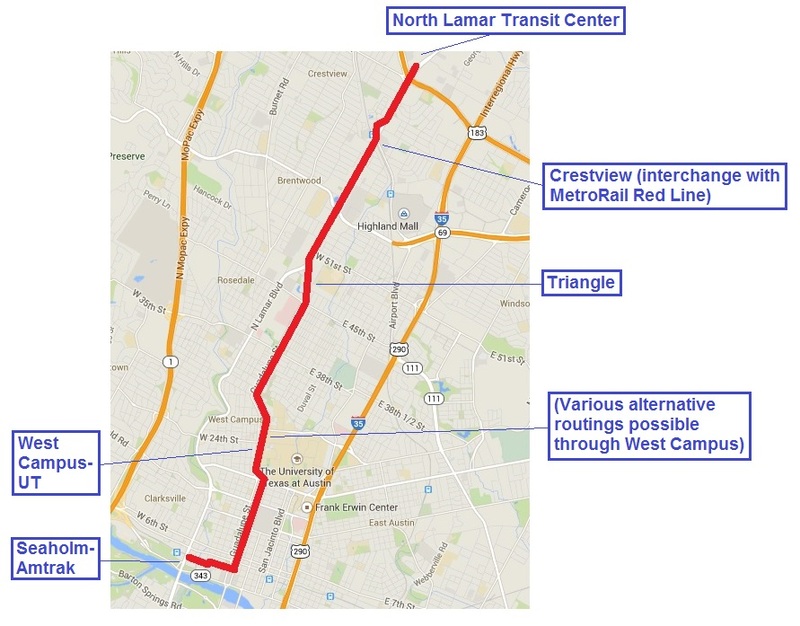 In a number of postings this website has focused on the need and various alternative possibilities for an initial light rail transit (LRT) starter line in the Guadalupe-Lamar corridor. However, it’s crucial to emphasize that this would be merely the starter-anchor-spine of future branches of light rail to create an eventual metro-wide system. Most of America’s most successful LRT systems – such as San Diego, Portland, Sacramento, Los Angeles, Denver, St. Louis, Dallas, Salt Lake City, Minneapolis, Phoenix – have expanded into more extensive citywide and even region-wide systems via this process of beginning with a single highly successful starter line. 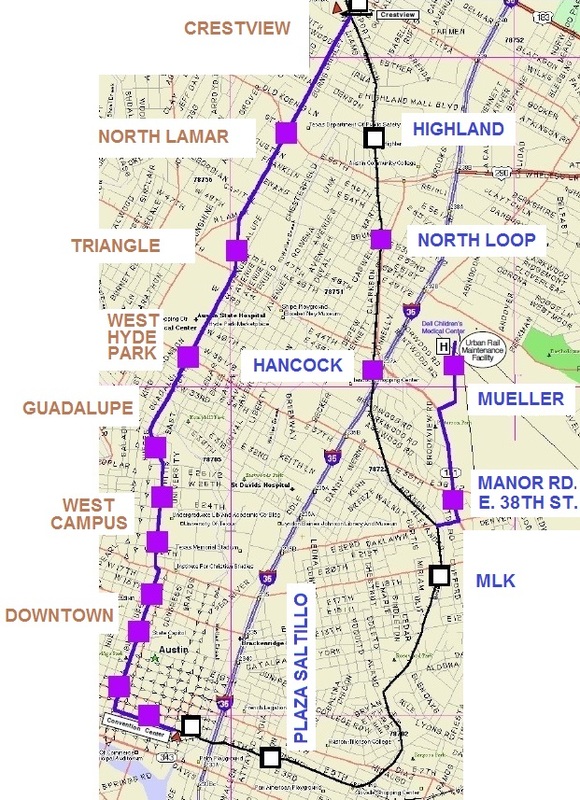 Guadalupe-Lamar is, first and foremost, well positioned as such a starter line that could become the basic spine for expanding into a system with routes reaching outward into the metro area. As we’ve also repeatedly emphasized, it’s essential to develop a vision of a system that serves as many sectors of the metro area as feasible, and present this to the public. This is why it’s essential to keep the scale, design, and cost appropriate and affordable. A number of Austin’s key corridors clearly have the residential and employment density, and the travel density, to support LRT. Certainly a “short list” of corridors worthy of inclusion in a viable system would include South Congress, South Lamar, and East Riverside, as well as extensions up North Lamar, conversion of MetroRail between downtown and Lakeline to LRT, and corridors through the Mueller redevelopment area into Northeast Austin, out East MLK into East Austin, and westward out Lake Austin Blvd. 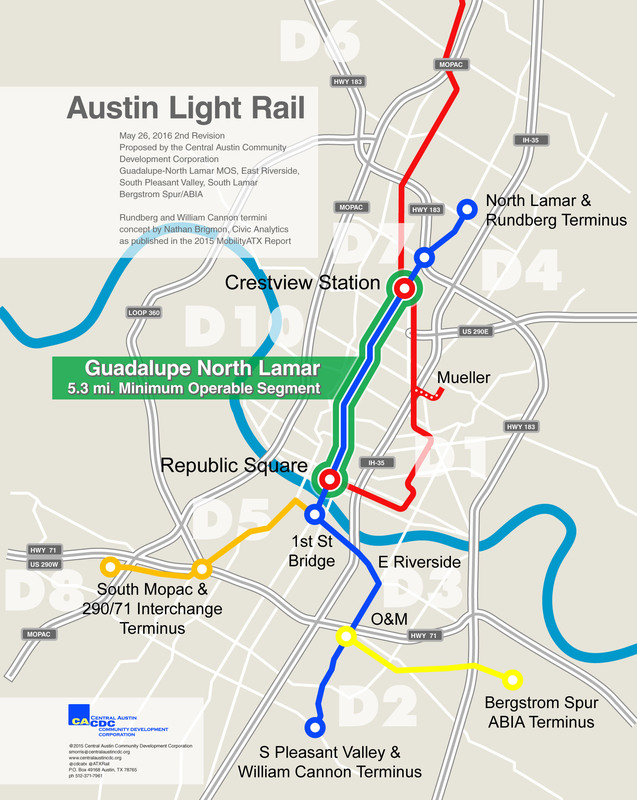 Recently community urban activist and Guadalupe-Lamar rail transit supporter Andrew Mayer created his own version of the kind of extensive citywide system Austin Rail Now has been proposing. As shown in the map below, Andrew’s plan has electric LRT lines reaching throughout the city, north, northwest, northeast, west, east, south central (SoCo), southwest (SoLa), and southeast to the East Riverside area. Proposed citywide urban rail system. Map: Andrew Mayer. Andrew’s “ultimate build-out” metro-wide LRT system map (as with similar proposed systemwide maps) is an excellent, plausible, and credible visioning tool, particularly for helping major civic leaders and the public in general understand the vision of where a fully effective urban rail system eventually needs to go in this metro area. So is a metro-wide LRT system a realistic, achievable prospect from the standpoint of financial resources? In 2014, at the height of the controversy over Project Connect’s then-proposed official Highland-Riverside $1.4-billion “urban rail” line, the implications for an expanded citywide rail transit system began to become a subject of more public discussion, with comparisons being made to other cities’ LRT systems, such as the expanding network of lines in Portland, Oregon. 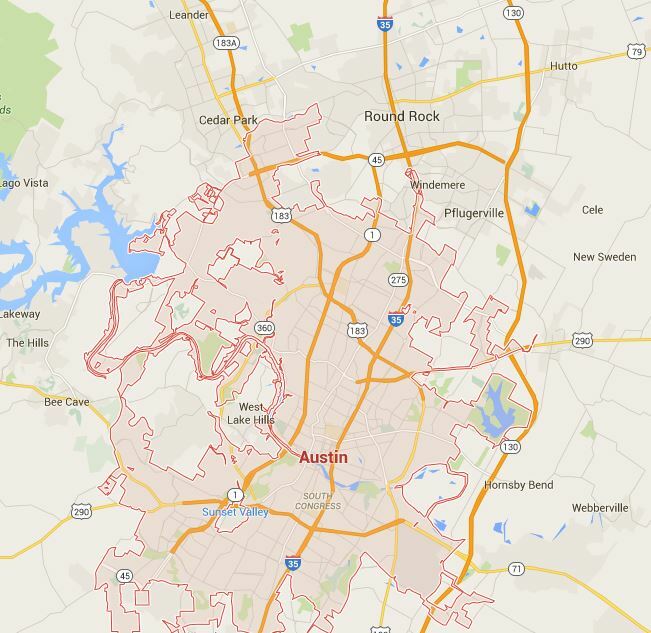 Some skeptics and rail transit opponents began brandishing a figure of “$8 billion” ($8.8 billion in some cases) as the investment cost of an Austin-area rail buildout comparable to Portland’s approximately 60-mile system — an exorbitant pricetag mainly based on an extrapolation of the extravagant cost of the Highland-Riverside project (a project facing some of the most challenging, expensive, and anomalous conditions in our own metro area). In reality, a well-designed, value-engineered multi-line system for Austin is likely to cost far less than either these inflated cost assumptions or even the costs that have faced LRT planners in Portland’s difficult terrain. All told, a plausible investment cost estimate for a 60-mile Austin system (including an initial Guadalupe-Lamar starter line) would most likely average about $73 million per mile (2016 dollars), with total current investment cost falling in the range of roughly $4.4 billion. A realistic timeline for buildout of such a system might be three decades (about the same as in Portland). If we assume 50% Federal Transit Administration funding, that implies a 50% local share of about $2.2 billion, about $733 million per decade, or roughly $73 million per year. Could the Austin region sustain a major rail transit development program of about $73 million per year? 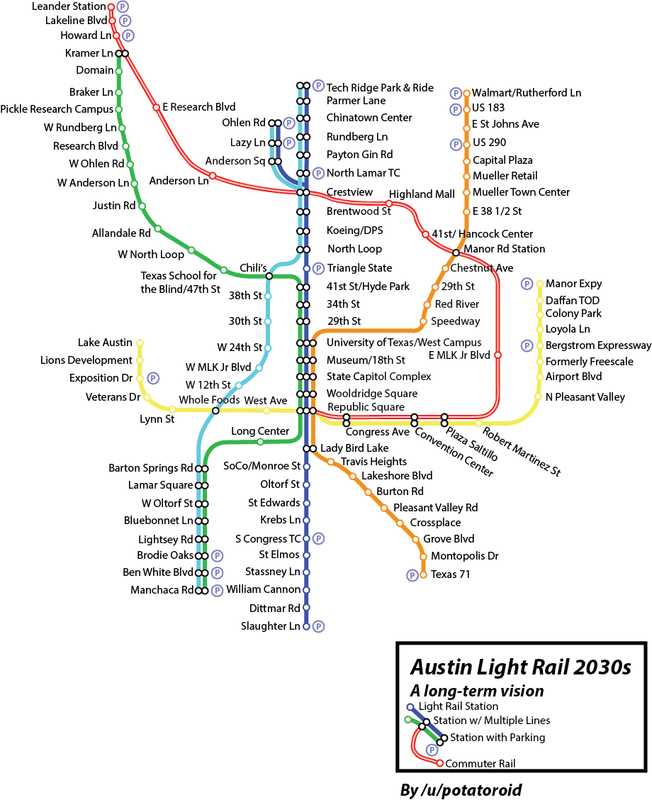 In view of current City of Austin and Capital Metro combined capital projects funding of more than $800 million per year, such an LRT starter line and system expansion program would indeed appear plausible, particularly with potentially available additional sources of funding (such as Tax Increment Financing) and other resources.